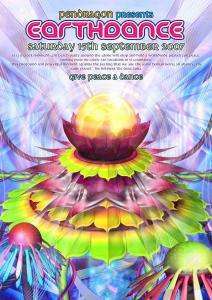 This Saturday 15 September marks the eleventh anniversary of Earthdance, the biggest international dance for peace on the planet. In 2006 the global festival took place in over 340 locations, with 57 countries being united through music and dance. This year the UK is fortunate enough to have a choice of two events: the flagship at London’s The Scala and a new weekender at the Wave Form Festival in Exmouth, Devon. 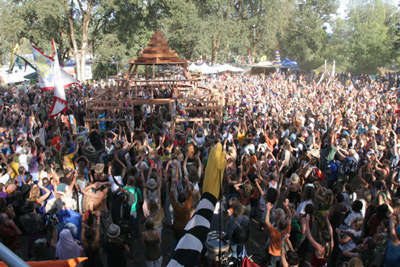 But how did a hippie rave founded by artist/musician Chris Deckker take on such epic proportions? We tracked down the main man behind Earthdance UK, Pendragon’s Mark Sinclair, to get the craic on the biggest synchronised dance event in history. 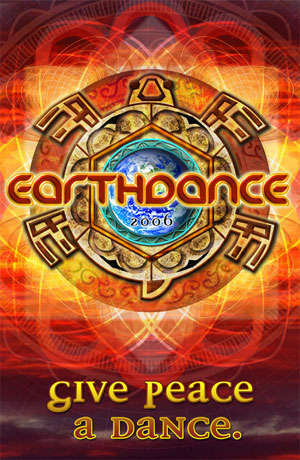 So what is Earthdance and how did it first begin? An artist/musician named Chris Deckker had a vision in 1996 of uniting the world with dance and music. Having started London’s first monthly trance night, Return to the Source, or RTTS as it became known, he was no stranger to promoting events. In 1997, 22 cities in 18 countries kicked things off and since then events have expanded to include jazz, world music, hip hop, folk and reggae in over 360 locations. Every party over the world plays the prayer in a simultaneous link-up, highlighting the true power of technology, dance and music. However there’s more to Earthdance then trying to get the global community to celebrate peace. Since its beginnings Earthdance has donated over $1,000,000 to charity, with each local promoter donating at least 50 per cent of any profits to the local charity of their choice. “Think Global, Act Local” is certainly the spirit encouraged. With Earthdance first originating in the UK, the Prayer for Peace takes place at midnight Greenwich time. RTTS founder Chris Deckker was in London when he first started what was to become a global phenomenon, but after running the event from the UK for just two years, he decided to move to San Francisco. He needed some trustworthy event organisers who were in the business for the right reasons to come on board, so it was perhaps no surprise that the promoters he picked were local party legends Pendragon. So how on earth does one put together a line-up for an event as diverse as this? While it should go without saying that all involved are doing this for the right reasons, I’m sure it can’t make putting the line-up together any easier. In fact the solution is simple, for this Saturday’s party is opened by Easy UK, an internet radio station who focuses on playing unsigned bands. They carry the flagship forward until midnight when the all important Prayer for Peace takes place… all over the world, at the same time. As mentioned above, this is really the heart of the festival, with the Prayer being played simultaneously over the entire planet, be that over the net, the radio or at one of the many festivals throughout the globe. After midnight Dreadzone comes on and the party really starts. They’re followed by Pendragon favourites The Morrighan, who are also guaranteed to put on a spectacular show. A full band with flamboyant performers and a live sound that brings together many instruments to create Celtic-fused dance mayhem, we agree that it sure beats two guys with a laptop playing to a screen. Having live bands is great, but of course this luxury comes at a cost, both in terms of time and expense. But one could argue that the vibe and atmosphere created is invaluable. 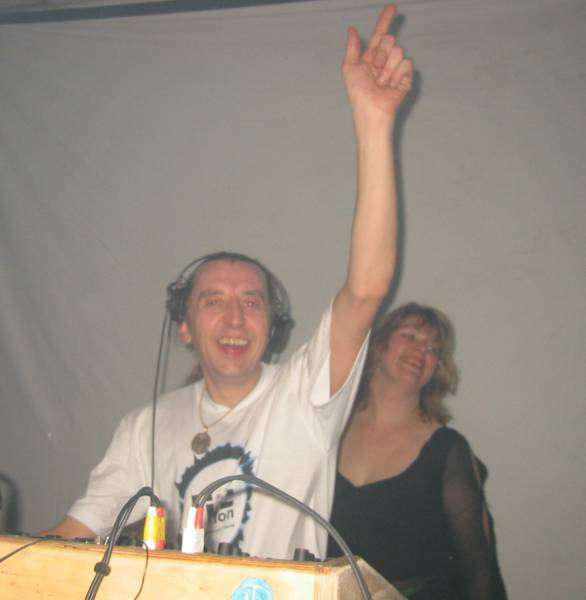 With Mark still on the end of the line it seems a fitting time to speak more about Pendragon, the wondrous rave that packed out the Fridge for so many years and inspired so many of the DJs and promoters still around today. So how did it all actually start? “In our back yard, like most parties!” Mark laughs. At a time when other events were starting to seem bland, Mark and his then partner Kate started to get fed up that no-one else was making much of an effort. A party called Gumbo was a source of inspiration and they hosted the main room at Megatripolis from time to time. However Mark and Kate were also into Celtic mythology and wanted to theme their events around Celtic festival dates. They made décor and backdrops using the symbols to go with the season and the story behind it — and ravers loved it. Unfortunately I was on the other side of the world at this time, so have many questions about these raves I’ve heard so much about, these parties that made so many of the DJs and promoters I know today fall in love with what was then a new and exciting music scene. Was it all just about hard trance or psy trance in those days, I wonder? Not at all, Mark assures me. He could never just stick to one genre. In those days, he feels they had nothing to copy so really had to find their own way. Music-wise Mark found this easy, because they just played what they liked. 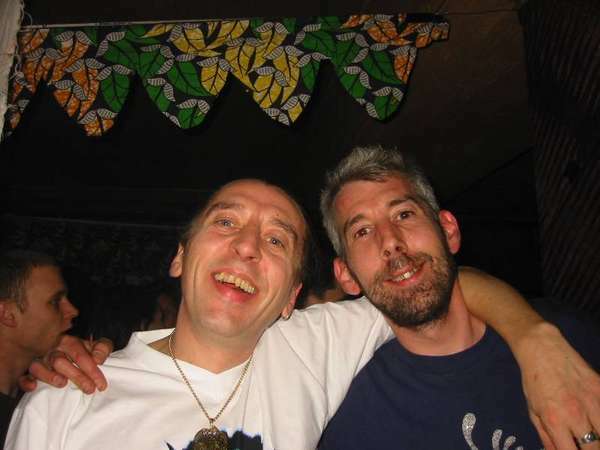 In those days before sub-genrefication it was all about good dance music, then things slowly started to split into trance, psy and hard house, which eventually split the music scene. Some parties came out of the hard trance scene, but Pendragon stuck with that they knew and loved, a lot of which happened to be uplifting European trance. But Mark also feels you couldn’t really pigeon-hole the Pendragon sound, because they liked to mix things up. 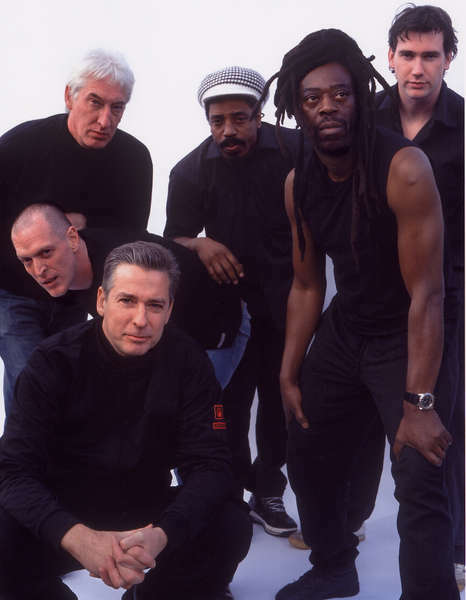 The fact that they were the first party to play the likes of Lab4, Kevin Energy and Scott Project is testament to their love of good music and innovative spirit. And that they certainly did. The Pendragon tent was one of the most popular of the entire event, with the combination of old fans and younger converts creating a heady mix and one massive rave. It transpires it was actually the first time the Pendragon crew had been together for a year and a half, so it was always going to be a bit special. They managed to completely transform their tent into a true Pendragon party in just a few minutes and it was rammed for the entire evening. Unfortunately the sound police kept turning the volume down, but it still kicked off. Mark and his crew all came away positive: no small feat given the dramas of the weekend experienced by other promoters and DJs. Speaking of which, we’re running out of time and I still have a few more things to discuss. When did Mark actually start DJing and how did he get into this record playing lark? Over twenty years ago, it transpires that Mark used to sing in a band and moved to London to follow the dream. He ended up in Brixton, but unfortunately the band split up. Left alone in the big city with his collection of northern soul records, he decided to start a club in what was to become George IV. It was completely different to what was around at the time. He also started getting into radio, where the likes of Fabio and Grooverider were all DJing and did a show every week for two years. Then, in the late ’80s acid house kicked off and the ’60s soul club lost it. Mark started buying the new house music he was hearing, getting seriously into deep progressive house. In fact he still plays house gigs, probably more so than hard trance these days. Having played house music for quite a while, he’s watched as it grew faster and more commercial. He also found he liked some early British progressive trance along the way, labels like Huge Tunes. Things got faster, the BPMs sped up and trance started getting into psy and prog making it harder. We establish that Mark has actually been DJing since 1984 — an incredible 23 years! Yet it’s obvious from his passion that he still loves music and DJing as much as ever. He’d love to get more gigs, but at the moment still manages to play out about once a week. Yet as this used to be more like four or five times a weekend, he does feel like he’s not playing out much any more. Promoters — take note! So would he do a Tinrib and go digital? Well the good news there folks is that he’s in the process of digitising his tracks into a hard drive and getting them all online. He’s working on his own website and slowly getting stuff up there... watch this space! And what about the future of Pendragon? Has it run its course? As Mark points out, they’re still going when a lot of parties have had their day: Return to the Source, Gumbo and countless others have all had their time… and perhaps Pendragon has too? This gets Mark reminiscing about the old days again, when he and Kate used to run regular events from home, in the days before computers while bringing up three kids. The event grew and grew and grew from their kitchen table, something they never dreamed of. When their tenth birthday sold out Brixton Academy they released doves at midnight, to celebrate that they had gone from their back yard to Brixton Academy — and were one of the first dance parties to do so. With so many others from around the world agreeing with him, it sounds like the best thing to do this weekend is to see what all the fuss is about. Earthdance London is at The Scala in Kings Cross, or else the Wave Form Festival runs for three days in Exmouth, Devon. Come and dance for peace — you never know, it just might work. Photos courtesy of Earthdance and the HarderFaster archive. Not to be repoduced without permission. Over 340 locations in 57 countries. Music: Trance. Tech Trance. Psy Trance. Prog House. Tribal House. Acid Techno. Funky Techno. Breaks. thanks for the wicked support at the 777 festival and i am sure there will be some light coming out from this soon. Total respect To Mark Sinclair and Pendragon, there tent at the festival was just like the old pendragon parties. I miss mashing it up to Mark Sinclair at Pendragon parties. Will not be at Earth dance but will look out for future events. 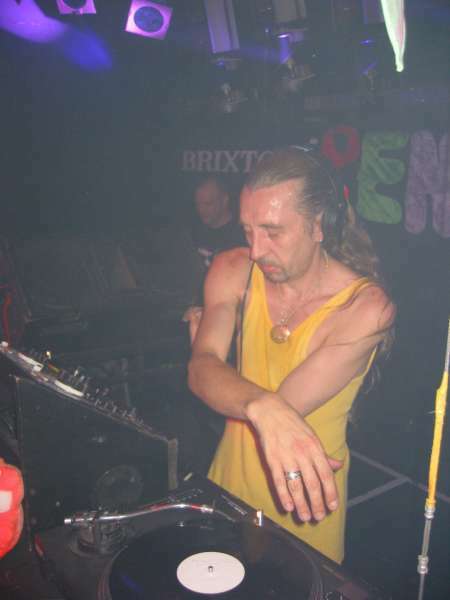 Pendragon is where i started ravin it up all those years ago , and is always a privilige to play alongside those legends .. nuff respect to Mark , Kate and all who strive to bring Earthdance to london. lets ROCK !!!!! 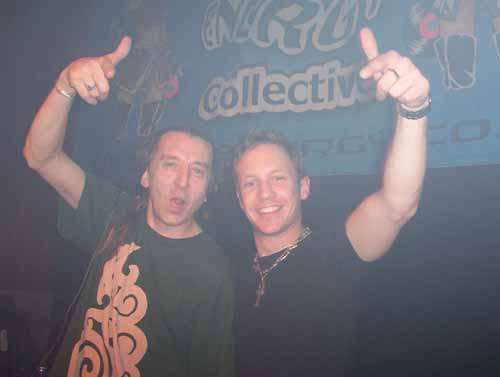 Lord Sinclair, a true trance legend!